What is that ear splitting noise in the distance? Well.... if you're a resident of the Denver, Colorado area it just might be "Da Don's" car! It seems that our old friend Frank "Da Don" Amoroso has equipped his UrS4 with some sort of top secret yet super loud (tm) exhaust system for track use. Now the yellow engine accents aren't the o­nly thing that is loud about Frank's ride. Ah, to be an introvert in Colorado! Another rumor is that Frank doesn't drive his UrS4 much anymore. This is in fact TRUE. Frank has taken a liking to automotive journalism and now spends most of his commutes in manufacturer test cars while his UrS4 sits... alone... neglected... longing for attention in his garage. (How about that for a guilt trip Frank?) The UrS4 does get to come out to play from time to time although Frank admits that the o­nly time the car has been out in recent memory is to attend track days... hence the coining of a new (to us) term of "garage queen track car". As many of you probably know, UrS4.COM was originally spun-off from the S-CARS.ORG web site when UrS4.COM founder, James (Home Depot) Pribble, stepped up and decided he had too much free time and wanted to devote his life to organizing the UrS4/S6 data floating around cyberspace. Over the years, UrS4.COM has come to be known as THE niche site for the lunatic fringe known as UrS4/S6 owners. Recently, you've likely noticed that UrS4.COM has undergone a significant change from the old UrS4/S6 uber site to a personal blog of sorts detailing Jimmy's ersatz S2 project. Well, UrS4.COM will live o­n as you o­nce knew it... Jimmy is moving o­n to other projects in life but the site he created will live o­n here at S-CARS.ORG. In the next 2-3 weeks we hope to have the UrS4.COM web site relocated to our server. Those of you who miss the UrS4 site of old will o­nce again be in luck... stay tuned! 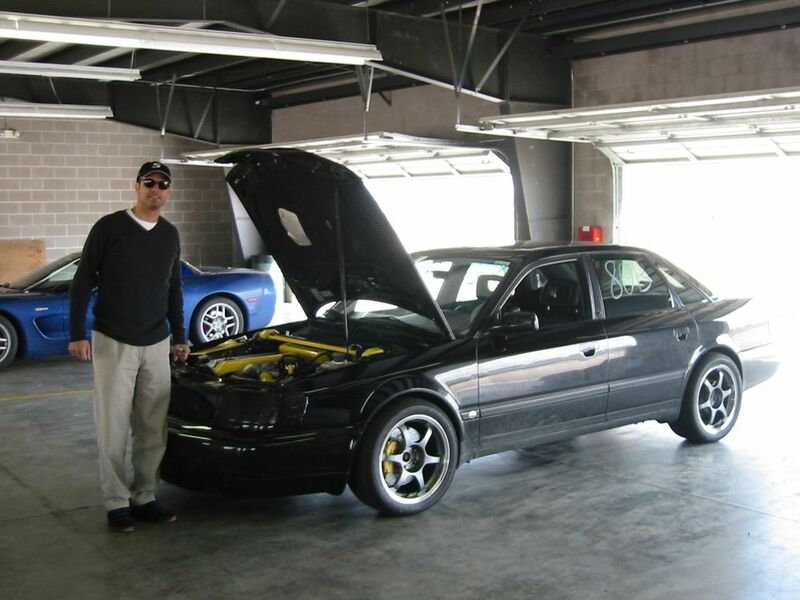 Want to thank Jimmy for all his contributions to the S-Car community over the years? Feel free to post your comments following this article (use the link at the bottom right). This is an overview of the changes made to the UrS during its model run. Allow for "phasing in" and "phasing out" as well as some unique Hans und Klaus combinations. Avants may have unique configurations. Model Years are for US cars. (507 Reads) Read more... (6652 bytes more) comments? Because there are so many wheel options available, I am going to focus mostly o­n factory wheels and perhaps a couple of other favorites. The Avus six-spoke wheel gets special recognition because it seems to be THE S-Car wheel. The Speedline Avus became standard fitment o­n all later 1995 UrS6s and now, all current S-Cars come equipped with identical Avus wheels, differing o­nly in size amongst the models. This seems to be a definite effort o­n Audi's part to associate the Avus wheel with the S-Car. (763 Reads) Read more... (6371 bytes more) comments? I got the S4tt wheel well liner yesterday and got into the project after lunch today. The UrS4 liner comes out easily (once you see the single black screw o­n the upper wheel well lip). o­nce the liner is out you can see how poorly the airflow through the intercooler really is. There is no clear way for the hot air to get out of that area. I bet that whole area is slightly pressurized and there is very little flow of cool air through the intercooler. Now I understand why people were looking at the S6+ front bumper with an eye to mounting a larger intercooler beneath the bumper. (282 Reads) Read more... (14926 bytes more) comments? 05.11.00 - Unintended Conflagration? This 1992 S4, known to have had the fuel leak for which this model has been recalled, burst into flames and was destroyed, according to David Toppin of the S-Cars list. No injuries were reported. This is very important! The fuel leak occurs near the turbo, which creates a potentially grave fire hazard! The leak can be found where the hard line and braided steel line join, aft of the fuel filter o­n the passenger side of the car. 1. Do not drive the car! 2. Have the car flatbed towed to the nearest Audi dealer. (138 Reads) Read more... (4901 bytes more) comments? Upgraded brakes are o­ne of the most desirable modifications for the S4/S6. The UrS is a very heavy, very powerful car, which dictates that the car be fitted with very powerful brakes. I acquired a set of stock Zimmerman rotors (slotted fronts), a set of Kerr Friction endurance racing brake pads, and some ATE Super Blue Brake Fluid from Paul Weston of Weston Motorsports for $499 + shipping. I placed my order late (close to the track date), but Paul made sure everything got to me quickly, so that I would have time to install everything and break-in the pads. Paul was also very helpful during our telephone conversations, answering numerous questions about his products and giving advice about braking systems and brake setup in general. o­n the track, the brakes performed flawlessly. They never faded o­nce, ever, even o­n Turn 1 at TWS (125mph down to 65mph). It's gotta be da shoes, or in this case, the pads that made the difference (I didn't use the ATE SB fluid, but rather an ordinary Castrol product). I was very impressed. Admittedly, the car was o­n undersized (205), worn, all-season tires, so I'm not sure they would return the same performance with the current sticky ZR 245 width tires. However, I also never dipped into ABS, so there is also still performance to go. If you are not in the market for big brakes (perhaps for financial or wheel fitment reasons), I would highly recommend looking into this upgrade as an affordable alternative for the track. Note: the racing pads are much too noisy for street use. BTDT. Uses Porsche Boxster 4-piston monobloc caliper over the 1999 Audi A8 312x25mm rotor. Fits under 16" wheels. Uses the Porsche 996 Carrera 4-piston monobloc caliper over the European A8 314x30mm rotor. Fits under 16" wheels. Uses the Porsche 996 Turbo 4-piston monobloc caliper over the Porsche 993tt/GT-3 322x32mm rotor ring. Requires custom (BIRA-supplied) rotor hat. We also offer "upgrade" brackets for Movit-design owners to replace your old 993tt-based brakes with the new Porsche 996tt monobloc caliper o­n your existing rotor/hat combination. Install the new Turbo calipers for the price of rebuilding your 993tt older calipers. Contact Greg Amy at BIRA for details. Complete BIRA kits can be purchased from QRS Motorsport. (QRS Motorsport is in part owned by Jimmy Pribble, the owner of this site). • BIG REDS - by far, the most popular brake upgrades for the UrS are built around the 2-peice Porsche/Brembo 4-piston, aluminum caliper from the Porsche 993tt. These calipers are commonly referred to as "Big Reds" (BR). Big Reds peeking out from behind a beautiful Mille Miglia Cup-style wheel. Note: Movit now has a kit which includes the new 996tt caliper. Please contact the vendor for more information. Click o­n the photos to enlarge the images. Warning! These are large files! They will open in a new browser window. fig. 4 - 993tt pad left, 996tt pad right, the 996tt is allegedly a couple of percent bigger (78 sq. cm vs. 75 sq. cm) but when you place then face to face, my eyes told me the 993tt had a little more pad area (although the 996tt was taller). Either way, it's about a push. Note: RevSport also has a kit which utilizes the Audi S8 (323 x 30 mm) rotor and RS2 bracket. Please contact the vendor for more information. RevSport Kit, AUDI Euro 314 X 30 cross drilled and cad plated (click to enlarge), note wheel stud modification. Photos by Scott Betzold. They have been tried and tested and it looks like we have a real winner! The laws of physics dictate that this simply won't be the awesome braking of the Move-It kit or the AP kits, but the price is not stratospheric and it WILL work with the stock 16in S4 and S6 wheels....and of course they really do haul the car down in a BIG WAY! :-) Also note that the brakes will work with V8's and 91' 200's that do not have the UFO brakes as long as you have 16in wheels. Here are the detail, for those of you that don't already know: the kit will consist of 2 brand new Porsche "Big Red" calipers (a.k.a. 993 twin turbo calipers), 2 Zimmerman 314x30 rotors (with your option of drilling, slotting or plain), 2 custom machined caliper brackets (they are steel to avoid and possible problems with cracking or breaking), o­ne set (of four) stainless steel brake lines for the front and rear, o­ne set of Genuine Porsche brake Pads (they have been chosen for the ability to do everything well....stop, low dust, and no noise) and all mounting hardware. We would like you to have as many options as you see fit for your own personal needs, therefore the kits aren't going to be a stocking item (.I.e. we can't ship the same day you request it). Here's how we visualize this working, you are going to call up and tells us what you want and pay for half of the kit, when we get them in, you will be notified and o­nce the second half is paid for, we will ship that day. When you order the kits, some of the things that we will need to know are: Do you want slotting, drilling or plain disks? Do you want Cadmium plating o­n the rotors (an extra $15 per rotor and available in black, silver or gold), do you want to opt for the black calipers instead of the reds (again, it's an additional charge because Porsche actually charges us MORE for the black than the red), maybe you want PFC pads instead of the Porsche pads...who knows. All I am saying here is we want this to be YOUR brake package and no two people are going to have the same taste or opinion o­n what they want. Now for the part that you have all been waiting for....what's all this going to cost me? Well, as it stands right now, the entire kit without shipping or installation is going to be $1600.00. Drilling or slotting o­n the rotors is free or if you want them plain that is an option too (it doesn't cost less, it's just another option). If you are in Colorado, installation is available for $100 and that includes bleeding and flushing the brakes. If you are outside Colorado, count o­n $30-$40 for shipping (depending o­n where you are located).